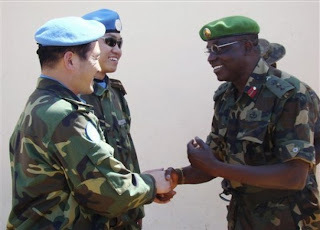 China in Africa: The Real Story: Being a Constructive Critic: "China's Growing Role in African Peace and Security"
Thanks for your comments - they are certainly constructive to unpacking some of the issues. I take your main point: our wording might have been better put together in the editing of the exec summary. Our statement definitely needs to be better qualified and better reflect the fact that we explore China's history of aid in Chapter 1 (p.4-5). Our point was that China is currently emerging to provide more assistance in a much more coordinated, less ad-hoc fashion. As I understand, it would be wrong to assume that current development assistance falls in the same category as the development projects of the Cold War period, which were to a degree informed by China's ideological and geo-strategic objectives of the time. It's absolutely true that it would be wrong to assume that China is now providing development assistance as part of a desperate search for resources, and we dispel the simplistic all-about-resources theories throughout the report (although it of course is a major component). Again, as a general one, our statement needs to be better qualified - especially the use of the word conditional on! At the bi-lateral level, we agree that Western governments also engage with all sorts of poorly-governed and/or non-democratic countries, as we say in the exec summary (p.iii) and in more detail in Chapter 4 (p.34-35) where we make many of the same examples as you (“inconvenient truths”). The general point was that, official level Western engagement in Africa – on the bilateral level but also from multilateral bodies like the World Bank or the EU - has included overt pressure for improvements in internal governance. In the case of regimes in Sudan and Zimbabwe, however, it would be an exaggeration to imply that western countries have the same level or type of engagement as China has. Egypt is an interesting case, but even the US, a staunch ally, has called for elections and reform. This is perhaps rhetorical and of questionable sincerity, but the nature of discourse itself marks Chinese and western forms of engagement clearly apart. You’ve clearly researched this area into some depth - more than us or perhaps International Rivers, where we got the material – and this is certainly something that will need more investigation in the future. We meant simply that Chinese actors were involved, not necessarily constructing, but as above this could be better qualified. However the important and relevant point (elaborated p.89-91) was that even seemingly harmless economic engagement or development assistance can have unintended knock-on effects for conflict. All actors, whether they be governments, NGOs, western donors or China, need to be more aware of these issues and participate responsibly. As International Rivers has pointed out, the case of Gibe III in Ethiopia – which various donors have refused to fund – might be a test for China. Again, your comments and criticisms are definitely constructive, and inaccuracies need to be pointed out. Seeking accuracy – and ensuring a balanced view is taken - are vital in what is often an overly politicised subject (“shi shi qiu shi”!? ).Your work – and blog! – are a useful addition for the rest of us. This is Koeuth Samuth, a student of Pannasastra University of Cambodia. I found your resourceful materials on China in Africa very interesting for my senior project. Your argument and findings have been mostly cited by many scholars, including me. As the relations between China and Africa is going on, motivation and strategies may change overtime. I would appreciate that you briefly provide me the current motivations, strategies and impacts of the Chinese presence in Africa. I can be reach at koeuthsamuth@yahoo.com. Thanks for the follow up, Tom. Nicely put. It might be of interest that it took me only two hours to track down the fate of all 25 of the projects mentioned in the International Rivers report, using the same internet/media sources. I don't expect everyone to be as curious as I am about the reality of reports they read! Of course since 2008, there have been a lot of new media reports of additional dams under discussion. I'm sure this is a growing area, with all the potential for conflict that you and IR rightly point out. This spreadsheet lists dam projects with various types of Chinese involvement. It includes projects which are developed or funded by Chinese institutions, or for which Chinese companies have won major contracts. For some of the projects, only a memorandum of understanding has been signed. Others are currently being studied regarding their feasibility or are under construction. Yet others have already been completed. The spreadsheet is based on media reports, and the sources of information are indicated. In some cases, we have double-checked the information, but we are not able to do this comprehensively, and cannot vouch for the accuracy of the information. Please be aware that not all entries in the database may be up to date. While some projects on the list may not go forward, others may be missing. We welcome corrections and additions. The spreadsheet is an information service which does not give exact figures, but indicates the approximate scale of Chinese dam building around the world.